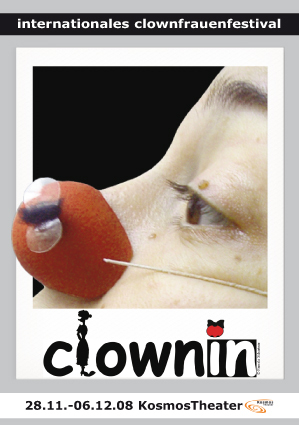 clownin is an international women's clown festival which takes place biennially at KosmosTheater since 2006. The festival is organized and curated by theater super.nova (Gaby Pflügl and Pamela Schartner) in coproduction with KosmosTheater and based on an idea of theater super.nova. Biennially in December for 9 days clownin brings international and national clown women to KosmosTheater Vienna. In two daily evening shows clown women offer their artistically ambitious and entertaining shows to an adult and interested audience. An Europe-wide unique opportunity to be able to admire this art form beyond the mainstream and as well laugh really hearty. Astonished and smiling faces guaranteed. The main focus of the festival is on pieces that tell a story. It is a festival for adult audiences only. There is also a wide framework program with workshops for beginners, discussion meetings, lectures, parties, round tables etc. 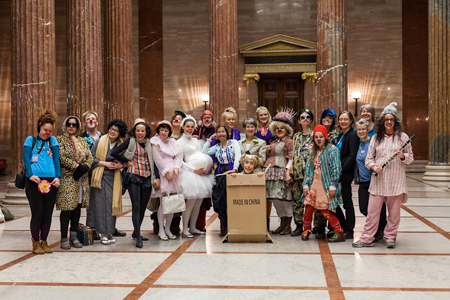 In 2012, the President of the National Council Barbara Prammer opened the festival and without hesitation invited the clown women to visit the Parliament. Since the beginning of time it has always been laughed at the world but the laughter was mostly a one-sided male, which lacked the female perspectives. Women were fun objects and allowed to laugh and did it well, but were not allowed to define what's funny. In contrast to that the rare species of clown women are able to gain the power of naming what is funny as they highlight artisticly the absurdity of the situation. The subversive view, the critical distance to themselves and others, philosophical depth and at the same time playful lightness are effective resources to question hierarchical structures. To make this large but largely unknown potential of female clown visible and tangible, initiators Pamela Schartner and Gaby Pflügl - with the support of Barbara Klein – started to launch a festival for women clown. The International Women's Clown Festival clownin happened for the first time in 2006 and was from the beginning a great success - in artistic and as well in terms of the degree of capacity utilization. In the first year, more than 1,400 visitors were welcomed within the 9 days (87% utilization), 2008, 2010 and 2012, the number of visitors rose to nearly 2,100 and 99% utilization. clownin in Vienna has established itself as one of the biggest festivals for Clown women worldwide. clownin works closely with Brazilian partners "Festival Esse Monte de Mulher Palhaça" in Rio de Janeiro and "PalhaçAria" in Recife, thus achieving global international response. The big stars never miss the Austrian festival. Also many newcomers have been discovered as many festival organizers form around the world as well as the Casting Department of Cirque du Soleil have the festival on their schedule. In 2006, the focus was set primarily on Austrian artists, which is why the title of the festival was 1st Austrian women's clown festival, which was amended in 2008 by expanding the focus in International Women's Clown Festival. 2006 12 performances with artists from 4 countries were shown. Topic of discourse: No clown/in town? 2008 14 performances by artists from 10 countries were shown. Topic of discourse: Women in the conflicting fields of "art - humour - poverty"
2010 14 Shows with 35 artists from 16 countries were shown. Topic of discourse: Working for fun? Art, humor and female unpaid labor. 2012 13 shows with 30 artists from 17 countries were shown. Topic of the discourse: When the curtain falls ... Sustainability in the clown and festival work.